We hold many assumptions about police work―that it is the responsibility of the state, or that police officers are given the right to kill in the name of public safety or self-defense. 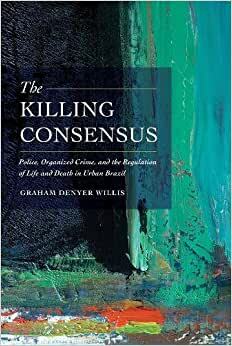 But in The Killing Consensus, Graham Denyer Willis shows how in São Paulo, Brazil, killing and the arbitration of “normal” killing in the name of social order are actually conducted by two groups―the police and organized crime―both operating according to parallel logics of murder. Based on three years of ethnographic fieldwork, Willis's book traces how homicide detectives categorize two types of killing: the first resulting from “resistance” to police arrest (which is often broadly defined) and the second at the hands of a crime "family' known as the Primeiro Comando da Capital (PCC). Death at the hands of police happens regularly, while the PCC’s centralized control and strict moral code among criminals has also routinized killing, ironically making the city feel safer for most residents. In a fractured urban security environment, where killing mirrors patterns of inequitable urbanization and historical exclusion along class, gender, and racial lines, Denyer Willis's research finds that the city’s cyclical periods of peace and violence can best be understood through an unspoken but mutually observed consensus on the right to kill. This consensus hinges on common notions and street-level practices of who can die, where, how, and by whom, revealing an empirically distinct configuration of authority that Denyer Willis calls sovereignty by consensus. Comece a ler The Killing Consensus no seu Kindle em menos de um minuto. Graham Denyer Willis is a University Lecturer at the Centres of Development and Latin American Studies and a Fellow at Queens' College, University of Cambridge. One of the best essays about violence in São Paulo ever written.